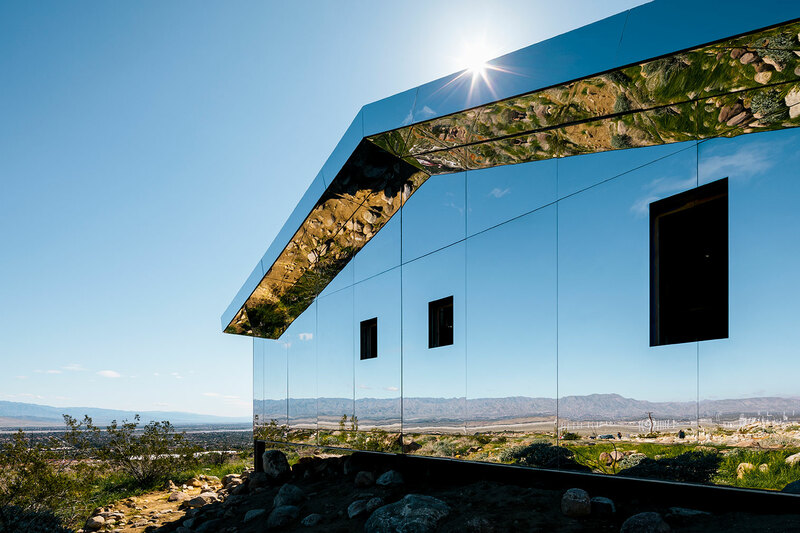 Artist Doug Aitken’s reflective ‘Mirage’ house is one of 16 artworks scattered across California’s Coachella Valley for new art festival Desert X. The dwelling – modelled on the classic American ranch house – comes clad inside and out with mirrored surfaces to create the sensation of appearing and disappearing into its arid surrounds. ‘Mirage is reconfigured as an architectural idea: the seemingly generic suburban home now devoid of a narrative, its inhabitants, their possessions,’ says Aitken. 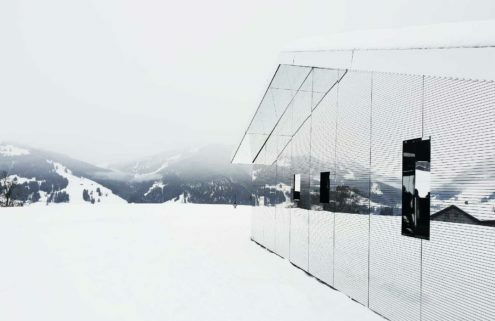 Joining his shiny creation in the desert are artworks by Richard Prince, Gabriel Kuri, Claudia Comte and Phillip K Smith III. 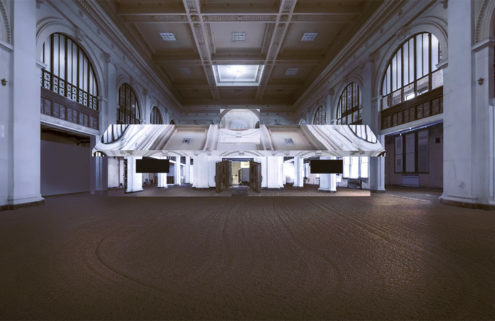 Prince has also riffed on the American architectural vernacular, designing a crumbling ‘cowboy’s retreat’ plastered with the artist’s family photos. 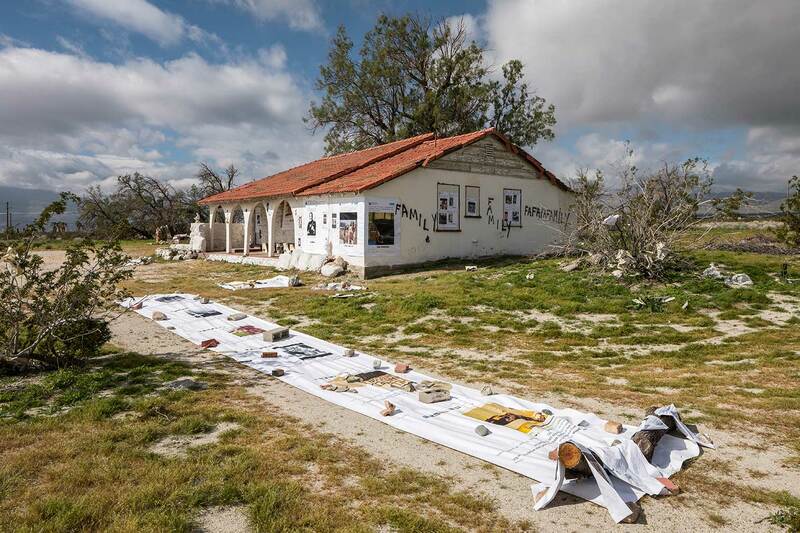 Desert X contemporary art show spans about 45 miles of the Coachella Valley, from Whitewater Preserve east to Indio. The free event is curated by Neville Wakefield, who is also behind Elevation 1049 art festival in the Alps. 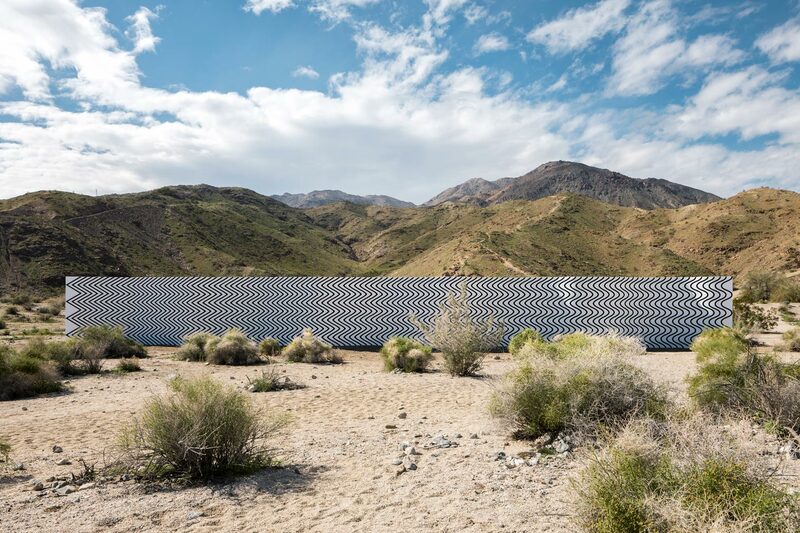 The rocky desert has long been a foil for ‘extreme versions of architecture’ – as Wakefield puts it – from Donald Judd’s interventions in Marfa, Texas, to the modernist homes of Palm Springs itself. ‘Think about mid-century modernism, and it’s no surprise that some of its most spectacular forms flourish most here against the blank canvas of the desert,’ Wakefield adds. 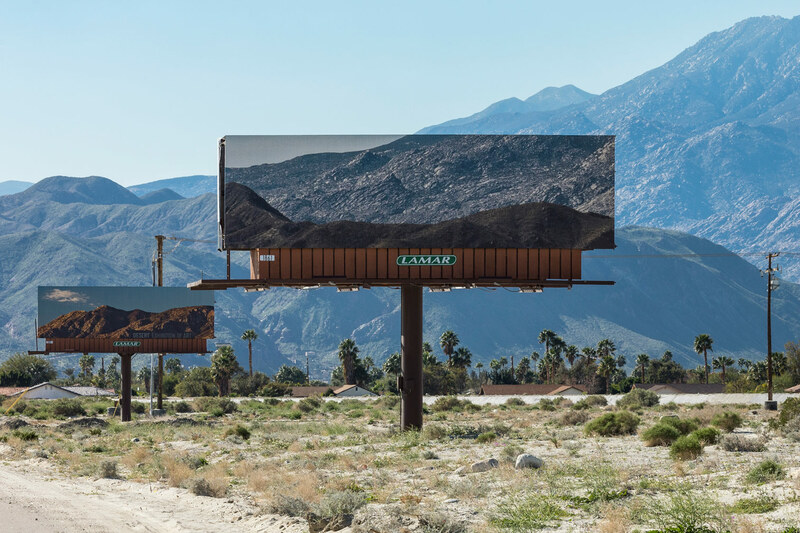 Desert X – which kicked off this weekend and runs until 30 April – strategically bridges Palm Springs Modernism week and Coachella music festival. 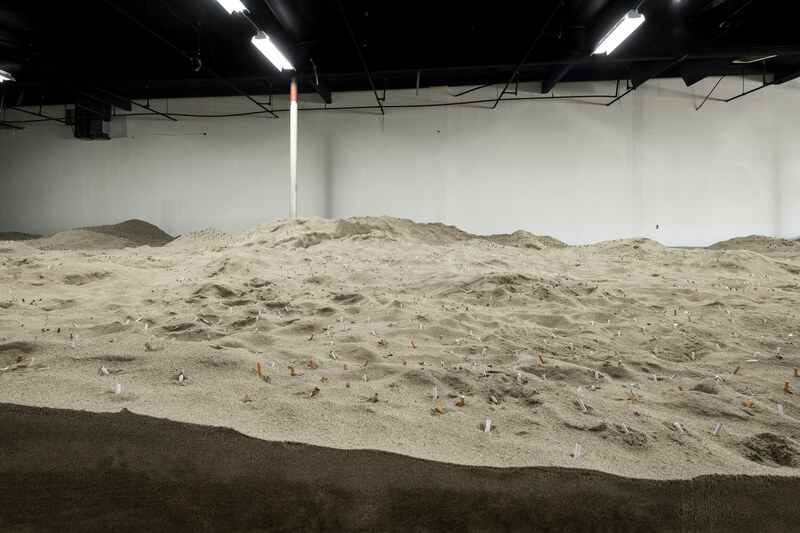 Elsewhere in the valley, Gabriel Kuri has filled a 6,000-square-foot empty shop with sand and cigarette butts, for his Donation Box installation. Visitors are invited to add to the piece by leaving coins behind, on top of the sand. 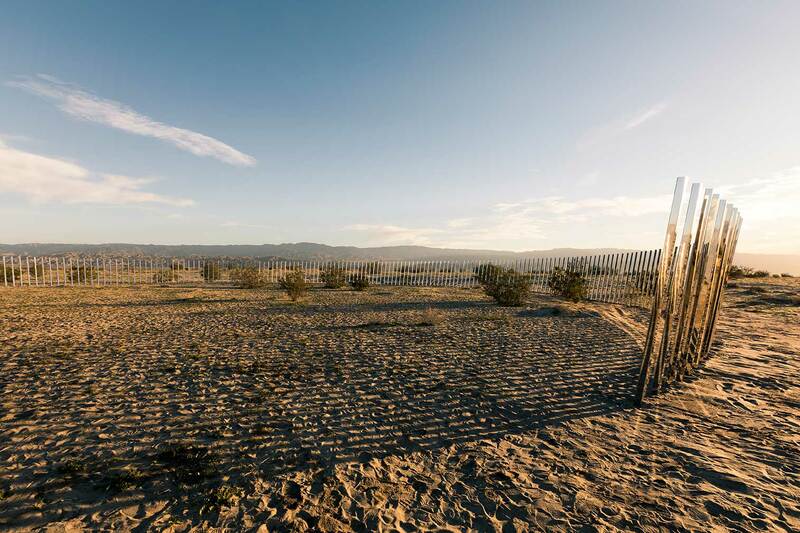 Meanwhile Phillip K Smith III has made the most of the desert’s expansive views, installing a 165-foot ring of mirrored stakes that reflect sky or land depending where in the circle visitors stand. 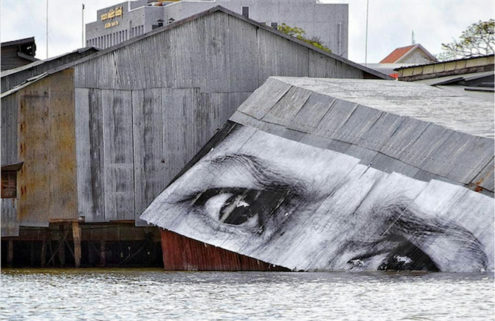 Claudia Comte has similarly played with perspective with her ‘Curves and Zigzags’ artwork, which features eye-bending black and white stripes spread across a 110-foot-long wall. 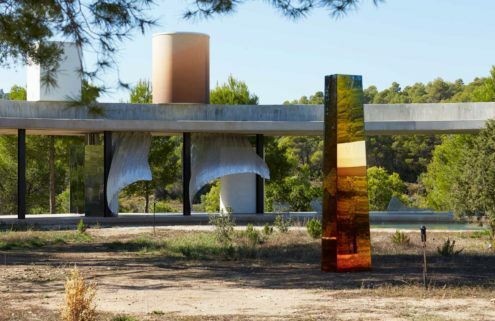 These Desert X spectacles will disappear from the landscape after 30 April, but Aitken’s Mirage house will remain in place until October 2017.